Steven Knight Griffin gives up a job he loves in a quest to help build a better world. 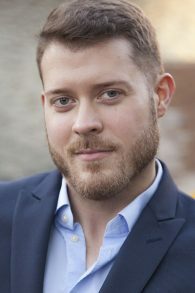 Steven Knight Griffin grew up in the 6th District, graduating from Lassiter High School in East Cobb before getting a history degree from the University of Georgia, and he lives in it still in the eastern corner where Tucker, Doraville and Brookhaven come together. He vows to hold monthly town halls with his constituents and to listen to their concerns, whereas he said Handel is only concerned with the 51 percent of voters who elected her and answers other district residents with silence or form letters. At age 30, he’s from the same generation as Ossoff, but he has spent his career in government work. He was a consultant with Deloitte, working on budget justifications for the Centers for Disease Control and Prevention, then went to work with the agency, helping translate its science into policy in the areas of autism, early childhood development, and the prevention of fetal alcohol syndrome and birth defects such as spina bifida. Health care thus is at the forefront of his federal concerns. As someone who gets health insurance from the exchange, he said he understands the concerns people have about a lack of options and increasing premiums. His prescription for the health care system starts with putting an end to trying to repeal and otherwise undermine the Affordable Care Act. He wants the government to make the promised payments to insurers to cover the sickest people, to restore the individual mandate and to stop pushing cheap, noncompliant plans, which draw healthy young people away from the exchanges and lead to higher premiums for everyone else and a destabilized system. Like Lucy McBath, he wants a public option, which he said would ensure consumers have a choice and would create price competition. Also like McBath, Griffin advocates broad-consensus gun safety measures, including gun violence restraining orders and a more thorough universal background check system that eliminates the loophole for private sales and covers sales of ammunition. Schools themselves need to be more secure, with single entry points and armed officers on duty, but Griffin doesn’t want to turn them into prisons. “I practice a quiet enjoyment of my own private faith, echoing Thomas Jefferson in his call for a clearly defined wall separating church and state,” he said. Griffin expressed strong support for Israel. “I’m actually surprised that we need to have this conversation,” he said, detailing Israel’s right to defend itself and the many reasons the United States should stand with the one representative democracy in the Middle East. Speaking weeks before Trump’s decision to drop out of the Iran nuclear deal, he said the agreement isn’t perfect but should be improved, not eliminated. That agreement is an example of the “assertive nonintervention” approach Griffin thinks should be at the heart of U.S. foreign policy around the world: engagement with allies to address problems without resorting to military force. The United States needs to be involved — the vacuum left by U.S. withdrawal produces disasters such as the rise of Islamic State and the Syrian civil war — but should not be the world’s policeman, he said. To that end, he said it’s important for Congress to reassert its war powers and revoke the blanket authorization for military force granted to presidents since 2001. Griffin recognizes that there’s no quick way to eliminate the budget deficit, let alone pay down the $20 trillion-plus national debt, but he said the effort should start by reconsidering the 2017 tax cuts and examining the defense budget rather than chopping Social Security, Medicare, Medicaid or the relatively small amount of discretionary spending. Griffin, who used a Pell Grant at UGA, wants that federal need-based scholarship program expanded to cover the full need of any student in STEM courses at a public university — with the possibility of moving to nontechnical courses in the future. Bigger Pell Grants, lower interest rates on student loans and expanded loan forgiveness for people who work in public service will chip away at the debt burden carried by college graduates, he said. Education “is how you break the cycle of poverty. This is how you stimulate the economy,” he said. The economy also needs immigration, Griffin said, although tech companies should have a tougher time bringing in foreign workers on H1-B visas instead of hiring Americans. “I would propose that companies who seek to use H1-Bs first prove that they can’t find the necessary talent stateside. Preference for the visas could then be given to those willing to pay the highest salaries,” he said. He wants a path to citizenship for people brought here illegally as children, although they shouldn’t be able to sponsor legal immigration for their parents. “In my mind, it is incredibly inhumane and contrary to the spirit and values that we hold dear to throw these children out of the country right now,” he said, and he feels the same way about any mass deportation efforts. He is against a border wall, which he said would be a waste of money that would harm the environment and would do nothing for the many people who enter the country on legal visas, then don’t leave as required. Despite a lot of angry rhetoric, he said the broad contours of a bipartisan approach to comprehensive immigration reform are visible. It should include a one-time amnesty, he said, and a legal system that is easier to navigate. Perhaps as part of that move to civility, he said House Democrats need to replace Nancy Pelosi as their leader. The possible successors include Cheri Bustos, Seth Moulton and Joe Kennedy. “Voters in general are hungry for new perspectives. They want new blood,” Griffin said. Ultimately, Griffin said he stands out from his Democratic opponents because of his experience with a federal agency, including dealing with Congress and federal appropriations. “There’s a lot we need to do and change, and we can’t waste time,” Griffin said.